The more we know about the ultimate cause, the better we can understand the effects. 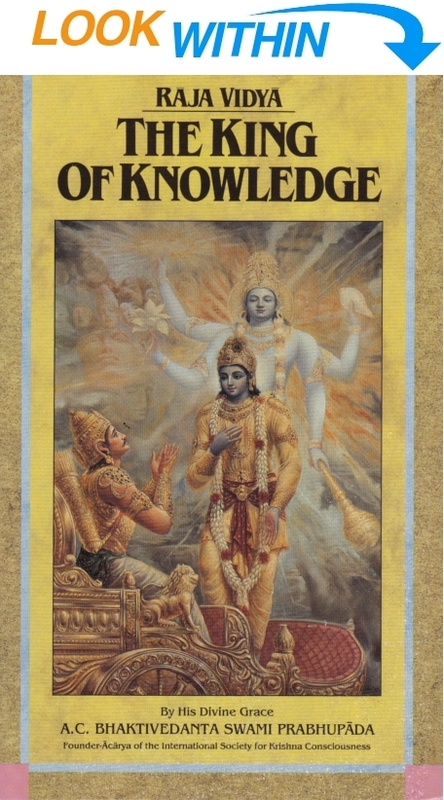 Raja-Vidya: The King of Knowledge is a collection of transcribed lectures by Srila Prabhupada on the ninth chapter of the Bhagavad-gita. In that section of the Gita, Krishna tells Arjuna why He's revealing divine knowledge to him; because Arjuna is free from envy. Srila Prabhupada points out that we can also understand the Bhagavad-gita to the degree we don't resent God's greatness. By knowing God as the source of everything, we can know everything else we need to know; we're spirit and not matter. Loving God is the ultimate goal of life. If we think we're everything, we'll envy God, and the Bhagavad-gita won't make sense to us. The King of Knowledge suggests practical ways to enhance our self-knowledge and understanding of the Supreme Person. The result of such knowledge is freedom from the anxieties of this temporary, ever-changing world. The opening words of the Ninth Chapter of Bhagavad-gita indicate that the Supreme Godhead is speaking. Here Sri Krishna is referred to as Bhagavan. Bhaga means opulences, and van means one who possesses. We have some conception of God, but in the Vedic literature there are definite descriptions and definitions of what is meant by God, and what is meant is described in one word—Bhagavan. Bhagavan possesses all opulences, the totality of knowledge, wealth, power, beauty, fame and renunciation. When we find someone who possesses these opulences in full, we are to know that he is God. There are many rich, wise, famous, beautiful and powerful men, but no one man can claim to possess all of these opulences. Only Krishna claims to possess them in totality. Here Krishna proclaims that He is the enjoyer of all activities and the proprietor of all planets (sarva-loka-maheshvaram). An individual may possess a large tract of land, and he may be proud of his ownership, but Krishna claims to possess all planetary systems. Krishna also claims to be the friend of all living entities (suhridam sarva-bhutanam). When a person understands that God is the proprietor of everything, the friend of everyone and the enjoyer of all, he becomes very peaceful. This is the actual peace formula. No one can have peace as long as he thinks, “I am the proprietor.” Who is capable of claiming proprietorship? Only a few hundred years ago the red Indians were considered to be the proprietors of America. Today we in our turn are claiming that proprietorship, but in four hundred or a thousand years perhaps someone else will come to claim the same. The land is here, and we come here and falsely claim ourselves to be proprietors of it. This philosophy of false proprietorship is not in line with Vedic injunctions. Sri Ishopanishad states that “everything animate or inanimate that is within the universe is controlled and owned by the Lord (ishavasyam idam sarvam [Isho mantra 1]).” The truth of this statement is factual, but under illusion we are thinking that we are the proprietors. In actuality God owns everything, and therefore He is called the richest. Of course there are many men who claim to be God. In India, for instance, at any time, one has no difficulty in finding at least one dozen people claiming to be God. But if you ask them if they are the proprietor of everything, they find this difficult to answer. This is a criterion by which we can understand who God is. God is the proprietor of everything, and, being so, He must be more powerful than anyone or anything else. When Krishna was personally present on this earth, no one could conquer Him. There is no record of His ever having lost a battle. He belonged to a kshatriya (warrior) family, and the kshatriyas are meant to give protection to the weak. As far as His opulence is concerned, He married 16,108 wives. Every wife had her own separate palace, and Krishna expanded Himself 16,108 times in order to enjoy them all. This may seem difficult to believe, but it is stated in Srimad-Bhagavatam, and the great sages of India recognize this as scripture and recognize Krishna as God. In the first verse of this Ninth Chapter, by the word guhyatamam, Sri Krishna intimates that He is imparting the most confidential knowledge to Arjuna. Why is He proclaiming this to Arjuna? It is because Arjuna is anasuyu —non-envious. In the material world if someone is greater than us, we are envious. We are not only envious of one another, but of God. Also when Krishna says, “I am the proprietor,” we disbelieve it. But this is not the case with Arjuna, who listens to Krishna without envy. Arjuna does not cavil with Krishna but agrees with whatever He says. This is his special qualification, and this is the way of understanding Bhagavad-gita. It is not possible to understand what God is by our own mental speculations; we have to hear, and we have to accept. Because Arjuna is not envious, Krishna speaks this special knowledge to him. This is not only theoretical knowledge but practical knowledge (vijnana-sahitam). Whatever knowledge we receive from Bhagavad-gita should not be taken for sentimentality or fanaticism. The knowledge is both jnana and vijnana, theoretical wisdom and scientific knowledge. If one becomes well-versed in this knowledge, liberation is certain. Life in this material world is by nature inauspicious and miserable. Moksha means liberation, and the promise is that by dint of understanding this knowledge one will attain liberation from all miseries.